Just like that, the first month of summer is almost gone! Even though I haven’t been training for a race, it’s been another busy month between work, a vacation and life in general. But let’s get into some of my favorite things from this month! Yes, trail running is popping up again. I cannot wait to get out for my next trail run. Until then, read about my first one and find out why I loved it so much! Mike, Vinnie and I had so much fun hiking last weekend and we cannot wait to get out some more. Especially now that we have a Minnesota State Park sticker for the next year and there are so many great hikes within a couple hours of driving. After having to re-knit my HamilKnit hat because it was too small, I finally finished it about a year after casting on the first one. It’s such a fun and easy knit (especially once I got into the main body) so now I’ve got to start on Mike’s since we are seeing Hamilton in early September! 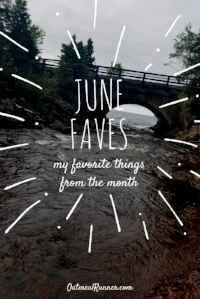 Share your favorite things from June in the comments!